BoomerangIt, the world's leading lost and found return service, is happy to introduce its newest line of retail packs  the BoomerangIt Worldwide Luggage I.D. and Mobile I.D. The packs mark the launch of the company's new Product I.D. series and provide protection for everyone on the go  travelers, professionals, students, families, sports enthusiasts  at an affordable cost. The new Luggage I.D. and Mobile I.D. packs include BoomerangIt's unique security ID labels and tags and provide product lifetime Global Lost & Found Service. Consumers can choose from several versions. The Mobile I.D. 's feature four, nine and eighteen labels and are ideal for portable electronics and other gadgets such as cell phones, PDAs, cameras and MP3 players. With the Luggage I.D. 's, customer can select among two mini, two large or a set of two mini plus two large luggage tags (for luggage, bags and other travel gear). Available now at Amazon.com and shortly at www.boomerangit.com, the packs retail anywhere from $6.95 to $17.95. Developed after extensive market research and based on customers' feedback, the new I.D. Packs are designed to provide the right number of labels and tags for just about anyone and satisfy every taste. With their attractive design, concise and easy to follow instructions, ready for display compact packaging and instant value recognition, the new packs make an affordable impulse buy for any retail environment and are a must-have accessory for travel gear and mobile electronics. What's more, they are the perfect stocking stuffer for this Holiday season, so retailers and distributors may want to get inventory in right away. Founded in 2001, BoomerangIt now has more than one million members and returns recovered items daily. 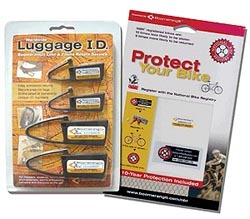 The brand evolved from the National Bike Registry (NBR®), the leader in bicycle security since 1984. While NBR registers bikes and scooters, BoomerangIt is for everything else. The service works with law enforcement, Good Samaritans and other fiduciaries, such as hotels, restaurants and airlines, to help return lost and stolen property to the rightful owners. Popular consumer electronic brands, luggage and sports equipment manufacturers including Palm, Toshiba, Pioneer Electronics, High Sierra, London Fog, Giant, Raleigh and Diamondback among many others, are bundling BoomerangIt with their products as a product enhancement to protect the customer's goods after the sale and are gaining greater customer loyalty as a result of the service. BoomerangIt I.D. labels and tags backed by a worldwide lost and found recovery service are ideal for any item that's valuable and vulnerable to getting lost or stolen  everything from keys to tech gadgets to luggage, sports gear and more. And just like in the U.S., if someone finds your item while you're abroad, BoomerangIt can facilitate its return, together with all the irreplaceable data, photos, and music that may reside inside, speedily and confidentially. Recoveries from all over the world are pouring in daily. The online record of registration in the BoomerangIt secure database also offers a convenient, well-organized, accessible any time, from anywhere inventory of personal or business belongings and can be used as a proof of ownership. "Register it. Label it. BoomerangIt. It's that simple," said Eddie Orton, founder and president of BoomerangIt, Inc. "For only pennies a year, our packs of serialized, tamper-resistant labels and tags can protect your stuff if it's ever lost or stolen." "BoomerangIt gives you a more secure ownership, so you can own better things," added Orton. "We have thousands of satisfied customers, many of whom registered their items with some initial skepticism. But after they lose something and get it back, the consensus from them is that 'the little sticker worked' and they've become our greatest fans." Once registered, if an item is lost or stolen, BoomerangIt can help get it back. If the item is lost, anyone who finds it can contact BoomerangIt online, or call 1-800-2Boomit (1-800-226-6648). Using the information provided in the product registration, BoomerangIt will facilitate the return of an item to its rightful owner. Of course, the finder pays nothing, and receives a reward. BoomerangIt is an official licensee of the National Crime Prevention Council (NCPC) and a portion of sales go to fund its "McGruff® the Crime Dog" programs. For more information or to place an order, please contact 1-800-226-6648, ext. 105 or sales@boomerangit.com, or visit us at the Ya-Ya! Bike "Face-to-Face" Pre-Interbike meeting at the Flamingo Hotel in Las Vegas on September 25, 3 pm -6 pm, for an official presentation. BoomerangIt (www.boomerangit.com) based in San Leandro, Calif., is a global lost and found return service that works with law enforcement and others to return lost and stolen property to its rightful owners. BoomerangIt provides an easy, inexpensive means to label and identify valuable items. It is also a theft deterrent, as studies indicate thieves are less likely to steal marked property. Founded in 2001, BoomerangIt now has more than one million members and is an official licensee of the National Crime Prevention Council (NCPC), with a portion of sales benefiting the "McGruff® the Crime Dog" programs. For more information or to purchase BoomerangIt labels and tags, visit www.boomerangit.com or call 800-2Boomit (800-226-6648).